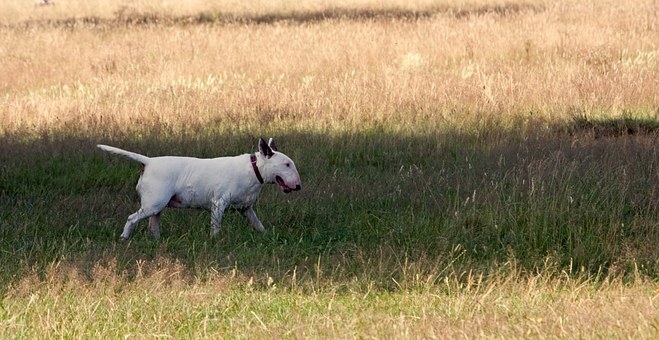 Dog attack on "very young child"
The dog is described as a white English Bull Terrier like this one. It happened in a field just off Ide Lane, near the doctors surgery at around 1140. The white dog - possibly an English Bull Terrier - continually bit the child's coat and the mother couldn't separate them. The local PCSO Will Malcom says luckily the child's winter coat stopped it being bitten. But both the mother and child are very shaken up after the "frightening incident". In a post on Facebook he said: "The actions of the dog would make me think that things would've been a lot worse if mother didn't stopped her child from falling over. This will be picked up by the Alphington Team and will be fully investigated to ID the dog and owner before it attacks someone again. If you know anyone around that area with this type of dog then please let us know. I have a name of the dog but i'm not going to disclose it on here. Log number is 355 if you can help.